The purpose of this analysis is to determine if there were repetitive patterns in the cumulative county vote shares in five recent Wisconsin elections. The patterns are obvious; the county graphs are virtual duplicates. This post is a work-in-process, but since the data tables and graphs are completed, I wanted to make them available while the analysis is ongoing. The following counties appear most anomalous: Brown, Dane, Jefferson, Kenosha, La Croix, Milwaukee, Oneida, Ozaukee, Racine, Richland, Sheboygan, Trempealeau, Walworth, Washington, Waukesha and Winnebago. Republican vote shares are increasing (lines slope upward) while Democratic shares decrease (slope downward) at the same rate. This is an indicator of likely vote switching. Walker won the recall by 171,000 votes (53.1-46.8%). In 15 large counties, Barrett’s vote shares at 25%, 50% and 100% of the cumulative total were 54.2%, 52.1% and 48.1%, respectively. The counties had 1.51 million of the total 2.52 million recorded votes. Milwaukee County is the largest and most anomalous. In the recall, Barrett had 63.3% of the total 396,000 votes. But he had 74.4% at the 25% mark, 70.4% at 50% and 66.5% at 75%. Looking at Barrett’s shares in terms of remaining votes, he had 59.4% of the final 75%, 55.9% of the final 50% and 53.0% of the final 25%. In other words there was a 21.4% decline in Barrett’s 74.4% vote share of the first 100,000 votes to 53.0% in the final 100,000 votes. Barrett’s True Vote Model 54.4% share is within 0.2% of his 15 county cumulative share at the 25% mark. His total Wisconsin share (assuming an equal level of fraud in the other 57 counties) was 52.4%. In the 15 counties, there was a 6.0% difference between Barrett’s 54.2% at the 25% mark and his final 48.1%. Adding 6.1% to Barrett’s official 46.3% total share, he had an estimated 52.4% Wisconsin True Vote share. In the 15 counties, there was a 4.0% difference between Barrett’s 52.1% at the 50% mark and his final 48.1%. Adding 4.0% to Barrett’s official 46.3% total share, he had an estimated 50.3% Wisconsin True Vote share. The cumulative vote analysis essentially confirmed the unadjusted exit poll. Obama won the WI recorded vote by 56.2-42.7%. He won the unadjusted exit poll 63.3-35.7%, a 7.1% increase over the recorded vote share. In 15 of the largest counties, Obama’s vote shares at the 25%, 50% and 100% of the cumulative total were 62.4%, 60.6% and 57.1%, respectively. The counties had 1.85 million (62%) of the 2.98 million total recorded votes. The following spreadsheets use data provided by GAB. Note that Milwaukee County is displayed at the top of the screen in each spreadsheet to illustrate the similar cumulative vote pattern in each of the four elections. 2012 Walker recall (contains voting machine types for each county and municipality). A forecasting model that does not utilize a Sensitivity Analysis of alternative forecast assumptions is incomplete. This analysis of 10 battleground states is based on various voter turnout and vote share scenarios. In 2008, Obama won the recorded vote by 52.9%-45.6%. 1. The number of returning voters is based on the 2008 state exit poll. 3. Turnout: 95% of Obama 2008 voters; 97% of McCain voters. 4. Obama wins 92% of returning Obama voters and 5% of McCain. 5. Romney wins 95% of returning McCain voters and 8% of Obama. 6. Even split of new voters. Given the above, there are two sets of sensitivity tables. There are 9 scenario combinations in each table. Of the total 18 scenarios, Obama won 14 in FL, 17 in OH, 15 in NC, 12 in CO, 17 in NV. He won all 18 scenarios in WI, VA, PA, IA and NH. Worst case: Obama 0% of returning McCain; 87% of returning Obama. Obama loses by 66,000 votes. Base Case: Obama 5% of returning McCain; 92% of returning Obama. Obama wins by 495,000 votes. Worst case: McCain 100%; Obama 92%. Obama wins by 307,000 votes. Base Case: McCain 97%; Obama 95%. Obama wins by 445,000 votes. Link to the Sensitivity Analysis. The analysis indicates that Obama should do quite well in these battleground states – unless, of course, the elections are stolen. The database has been restructured for easier use. It is based on county recorded vote changes and 2000 and 2004 as well as National Exit Poll vote shares. It now calculates the approximate 2004 True Vote for counties in 21 states. The database contains Election Day recorded votes. In 2000 approximately 2.7 million votes were recorded after Election Day; in 2004 approximately 6 million were. Gore and Kerry each had 55% of the late two-party vote. In 2000, there were approximately 6 million uncounted votes. In 2004, there were approximately 4 million. Gore and Kerry had 70-80%. Total Votes Cast, which includes uncounted votes, are not available by county and therefore not included in the County True Vote calculations. Therefore, the Democratic County True Vote is conservative (uncounted votes are 70-80% Democratic). Total votes cast are included in the National and State True Vote models. The number of returning 2000 voters is calculated assuming 5% voter mortality over the four year period. The default turnout assumption is that 98% of living 2000 voters voted in 2004. The number of new voters is calculated as the difference between the 2004 recorded vote and the number of returning 2000 voters. This is just an approximation since the recorded 2000 county vote is used – not the True Vote based on total votes cast . The Model uses adjusted 12:22am National Exit Poll vote shares as a basis for calculating total state and county vote shares. The adjusted shares are applied to each county’s estimated share of new voters and returning Gore, Bush and Other voters. The weighted average of the county vote shares should closely match the calculated state True Vote. State and county vote shares are calculated based on the differential between the unadjusted state and national exit poll shares. The Input sheet is for data entry. Enter the state code in cell A2. The default assumption is that 2000 voters return to vote in proportion to the 2000 unadjusted exit poll. Enter code 1 to use the 2000 recorded vote as the returning voter option. Since the unadjusted 2000 exit poll is close to the True Vote, the default option is a better choice. The user has the option of incrementing the returning Gore voter mix percentage. The Bush share will decrease (increase) by the same percentage. The living 2000 voter turnout rate is set to 98%, but can be changed if desired. In order to gauge the impact of changes in vote shares, incremental changes to Kerry’s base case vote shares can be input. Bush’s shares will adjust automatically in the opposite direction (the total must equal 100%). Other third-party vote shares are unchanged. The data is sorted by 2004 county vote. The discrepancies are displayed as vote margin (in thousands) and a percentage. The probability of fraud increases as the discrepancy increases. The county True Vote is only an estimate. It can only be determined if the ballots are hand-counted. The correlation statistic shows the relationship between two variables and ranges from -1 to +1, where -1 is a perfectly negative correlation and +1 is perfectly positive. A near-zero correlation indicates that there is no relationship. A positive correlation indicates that both variables move in the same direction: as one variable increases (decreases), the other also increases (decreases). A negative correlation indicates just the opposite: as one variable increases (decreases) the other decreases (increases). The model calculates the correlation statistic (relationship) between Kerry’s recorded vote share and the True Vote discrepancy. In general, there is a strong negative correlation between the variables, indicating that as Obama’s recorded county vote share increases (decreases) the discrepancy decreases (increases). This is an indication that the GOP counties are the most fraudulent (as measured by vote share margin discrepancy). For example, in Ohio, the -0.82 correlation was very strong indicating that Bush counties were extremely fraudulent relative to Kerry counties (based on vote share margin discrepancies). At 8:40pm CNN showed that of 2846 exit polled, Bush led by 49.8-49.7%. Kerry won the unadjusted exit poll (2862 respondents) by 50.8-48.0%. But at 1:41am, the poll flipped to Bush (52.1-47.9%) for the SAME 2862 RESPONDENTS, matching the recorded vote a 381,000 vote margin. Kerry won the True Vote by 52.7-46.1%, a 500,000 vote margin. Broward, Hillsborough, Palm Beach, Dade, Pinellas. Kerry won the unadjusted exit poll (2020 respondents) by 54.1-45.9%. At 1:41am, the poll flipped to Bush (50.9-48.6%) for the SAME 2020 RESPONDENTS, matching the recorded vote, a 119,000 vote margin. Kerry won the True Vote by 53.1-45.5%, a 426,000 vote margin. Ohio used Punched card machines, DREs and Optical Scanners. Kerry won the recorded vote by 58.4-40.1%, a 1,251,000 vote margin. Kerry won the Exit Poll by 62.1-36.2%. Kerry won the True Vote by 63.0-35.1%, a 2,060,000 vote margin. Kerry won the recorded vote by 49.7-49.3%, an 11,000 vote margin. Kerry won the Exit Poll by 52.0-46.8%. Kerry won the True Vote by 52.8-45.6%, a 217,000 vote margin. In 2000 Gore won the exit poll (47.2-46.4%) but lost the vote by 50.9-44.7%. In 2004, Bush won the exit poll (52.8-46.3%) and the recorded vote (54.9-44.4%). But Kerry won the True Vote by 52.0-46.2% (assuming 2000 voters returned in proportion to the 2000 exit poll). If the model is correct, there was massive election fraud (a 16% discrepancy). The 2000-2004 Presidential County Vote Database is a forensic spreadsheet tool for viewing, filtering, sorting and comparing county vote changes from 2000 to 2004. It is important to note that the database contains Election Day recorded votes. The state True Vote is calculated as well. The 2004 county voting machine type is indicated. 3. Enter the state code to filter the 2000-2004 county votes. Sort any column by clicking the arrow in row 13 of the column. Choose A-Z for low to high or Z-A for high to low. Examples: Filter for a state, then sort by county vote, vote share, machine type, etc. In 2000 Gore won the recorded vote by 540,000. But there were nearly 6 million uncounted votes. Gore won the unadjusted exit poll by 50-44% – a six million vote margin that was close to the True Vote Model. In 2004, Bush won the recorded vote by 3 million. There were nearly 4 million uncounted votes. Kerry won the unadjusted exit poll by 51-47.5%. The True Vote model indicates that he had 53.5% and won by 10 million votes. Why bother to analyze state and county recorded votes? What if a county had a near-zero percentage increase in Bush’s 2004 margin from 2000? In other words, if there was nearly equal fraud in both elections, how would we know? If we have evidence of 2004 fraud in a given county, but there was no change in margin from 2000, then we can hypothesize that fraud also occurred in 2000. Conversely, if there was a change in margin in 2004, we could hypothesize that there was an increase in the fraud factor. Since Election Fraud is systemic, the 2000/2004 county vote database has applicability in other state and presidential elections. New York had the highest level of fraud; there was a 55% average difference between comparable Kerry and Bush correlations. Florida was next at 49%, Ohio had 35%. Oregon, the only vote-by-mail 100% paper ballot state with mandated random county hand-recounts, had just a 4% difference. The results confirmed a prior analysis which indicated a) that Oregon stood alone as the only fraud-free Battleground state and b) confirmed that election fraud caused the large exit poll discrepancies in New York, Florida and Ohio- and many other states. Bush’s 2004 recorded NY county vote gain over 2000 is indeed an Urban Legend. His percentage gain in the 15 largest NY urban and suburban (Democratic) counties far exceeded those of Kerry. In 2000, Gore won the NY recorded vote by 60-35% with 5% to third parties. But Kerry won by just 58-40%, a 7% decrease in margin. NY voted exclusively on Lever machines which had the highest discrepancies (11%) of all voting machine types. In 2004, Nader had less than 0.5% of the vote nationally. Since returning Nader voters preferred Kerry over Bush by 64-17%, Kerry should have won NY by 63-36% (assuming zero net defections of returning voters). In fact, he won the unadjusted exit poll by 62.1-36.2%. But his recorded margin exceeded Gore in just 6 of 62 counties. Columbia was the ONLY COUNTY where Bush had fewer votes than he did in 2000 – an indication of zero fraud. Bush had 12,100 votes in 2000 and 11,200 in 2004. Gore won the FL unadjusted exit poll by a whopping 53.4-43.6% (3% to Nader et al), but Bush won by 537 votes. They were tied at 48.8% – only because the Supreme Court stopped the recount. There were nearly 200,000 uncounted spoiled ballots, a combination of undervotes, overvotes, Butterfly ballots, etc. 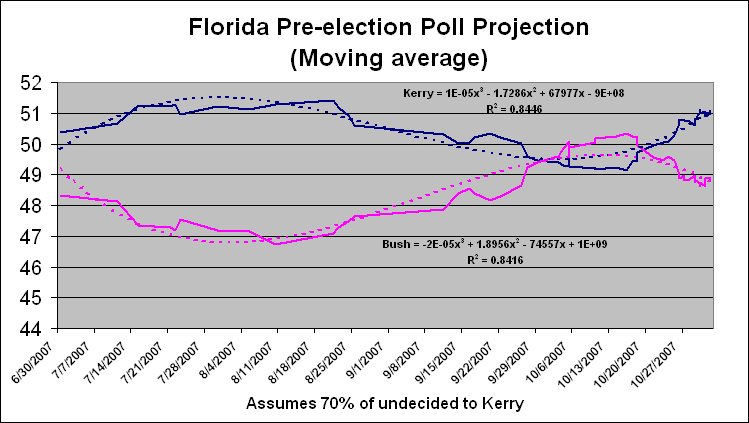 Contrary to the conventional wisdom, Kerry led the 2004 pre-election polls. In 2004 Bush won again, this time by 52.1-47.9%. Returning Nader 2000 voters broke by nearly 4-1 for Kerry, who also won the unadjusted exit poll by 50.8-48.0%. So how did Bush do it? Well, for one thing FL voting machines were now a mix of unverifiable DREs and Optical scanners. No more punch cards. No more hanging chads. HAVA fixed that problem, so that votes could be stolen cleanly in Cyberspace. No longer would there be blood evidence at the crime scene. The biggest Democratic counties (Palm Beach, Broward and Dade) showed virtually no change in Bush’s margin from 2000 to 2004. But changes in county recorded votes can be misleading. Does no change mean that there was no fraud? Obviously not. Election Fraud in both 2000 and 2004 caused Gore and Kerry margins to decline at nearly the same rate. The near-zero net change in margin masks the uniform vote thefts. But the the level of fraud must have increased in counties where Bush gained the most over his 2000 vote (Brevard, Polk, Hillsborough, etc.). Margins increased by 4% in Hillsborough, 7% in Broward and 6% in Palm Beach. These counties used DRE touchscreens in 2004. Of the 67 Florida counties, Kerry did better than Gore in just five, whereas Bush increased his margin in 62. But in Leon County there was a 10,000 increase in Kerry’s margin, his biggest county gain. Does the fact that Ion Sancho, the Election Integrity activist whose famous “Hursti Hack” demonstrated that Optical Scanners can be rigged and also happens to be the Leon County Election Supervisor, have anything to do with it? This 100% paper ballot state uses Optical scanners. Vote is by mail or hand-delivery of ballots to a polling site. A hand recount of ballots is mandated for randomly selected counties. Not surprisingly, with the combination of mandated hand counts (a fraud deterrent) and high turnout, Oregon was the only Battleground state that Kerry won by a margin better than Gore. Gore won Multnomah, Oregon’s largest county, by 104,000 votes (64.3-28.6%). But Kerry did even better. He won it by 152,000 votes (72.5-27.5%) and apparently picked up a large number of returning Nader 2000 voters. It’s very telling to compare Kerry’s expected gains in urban Multnomah to Bush’s impossible, unexpected gains in heavily Democratic NY counties. Oregon is a 100% paper ballot state, mandates random hand recounts and enjoys heavy voter turnout. Do these factors have anything to do with Oregon being the only Battleground state in which Kerry’s winning vote share exceeded that of Al Gore? In 2000, Bush beat Gore by 50.0-46.5%, but the exit poll was close (48.5-47.4%). In 2004, Kerry won the exit poll by a solid 54.1-45.7% but lost the recorded vote by 50.8-48.7% – quite a red-shift. Although there were many Battleground states and strong Democratic states in which vote miscounts favored Bush, Ohio was the epicenter of election fraud. The majority of its 88 counties voted on punch card machines, the rest on DREs and Optical scanners. In 2000, Gore won Cuyahoga County (Cleveland) by 63-34%. Kerry did even better; he won by 67-33%. Kerry had a 61,000 net gain in margin. But keeping in mind that these are recorded vote shares. Based on the vast evidence of documented fraud, Gore and Kerry must have done much better than their recorded votes indicate. Bush vote gains from 2000 were highest in Butler, Warren and Clermont counties. All had numerous voting irregularities and anomalies. Did Ken Blackwell, Secretary of State and co-chair of the Ohio Bush-Cheney campaign, have anything to do with Kerry losing Ohio ? The True Vote Model (TVM) calculates vote shares and margins based on estimated returning voter mix and National Exit Poll vote shares. Popular vote win probabilities are also displayed for various vote share scenarios (“sensitivity analysis”). The analysis shows that Kerry won all plausible vote share scenarios in Ohio and Florida. Four methods are used to estimate voter turnout based on prior election 1-recorded vote, 2-votes cast, 3-Exit Poll, 4-True Vote and an estimated turnout rate. The TVM produces sensitivity analysis (5×5 tables) of vote shares, margins and popular vote win probabilities for a range of returning and new voters. The most likely scenario is in the central cell of the table, the worst case is in the lower left cell, the best case is in the upper right cell. The win probability is a function of the 2-party vote shares and is calculated using the Normal Distribution Function. At 7:30pm, Kerry was leading the Ohio exit poll by 52.1-47.9% (1963 respondents). He won the unadjusted exit poll (2020 respondents) by 54.1-45.9%. At 1:41am, the poll flipped to Bush (50.9-48.6%) for the SAME 2020 RESPONDENTS, matching the recorded vote. Bush won the recorded vote 50.8-48.7%, a 119,000 vote margin. Assume 2000 election voters return in proportion to the 2000 unadjusted Ohio exit poll won by Bush (48.5-47.4%). In the Worst Case scenario, Kerry captures 55.7% of new voters and 9.7% of returning Bush 2000 voters. He wins with 52.2%, a 313,000 vote margin and 97.1% win probability. In the most likely Base Case scenario, Kerry captures 59.5% of new voters and 11.7% of returning Bush 2000 voters. He wins with a 53.7% share, a 480,000 vote margin and a 99.8% win probability. At 8:40pm CNN showed a virtual tie. Of 2846 exit polled, Bush led by 49.8-49.7%. Kerry won the unadjusted exit poll (2862 respondents) by 50.8-48.0%. But at 1:41am, the poll flipped to Bush (52.1-47.9%) for the SAME 2862 RESPONDENTS, matching the recorded vote. Bush won by a 381,000 recorded vote margin. Once again, assume that 2000 election voters return in proportion to the 2000 unadjusted Florida exit poll which Gore won by 53.4-43.6%. In the Worst Case scenario, Kerry captures 52.2% of new voters and 7.5% of returning Bush 2000 voters. Kerry has 53.2% and wins by 569,000 votes with a 99.5% win probability. In the Base Case scenario, Kerry captures 56.2% of new voters and 9.5% of returning Bush 2000 voters. He has 54.8%, an 800,000 vote margin and 100% win probability. Ron Baiman and Kathy Dopp at US Count Votes did a statistical analysis of 49 Ohio 2004 exit poll precincts. • 4% (2) of Ohio’s exit polled precincts had official Bush official vote that had less than a 5% chance of occurring. In these precincts Bush official vote share (assumed to be one minus their Kerry share) was much smaller than expected, given Bush’s exit poll share. This analysis has been updated to include the 2008 unadjusted state exit polls. In the last 3 elections, the average Democratic late vote share was 7% higher than the vote share recorded on Election Day. On Election Day 2000, 102.6 million votes were recorded; Gore led by 48.3-48.1% (50.1% of the 2-party vote). Gore had 55.6% of the 2.7 million late 2-party votes, an 11.0% increase in margin. There were 6 million uncounted votes. On Election Day 2004, 116.7 million votes were recorded; Bush led by 51.2-48.3%. Kerry had 54.2% of the 4.8 million late 2-party votes, a 10.4% increase in margin. There were 4 million uncounted votes. On Election Day 2008, 121.21 million were recorded. Obama led by 63.4-56.1m (52.3-46.3%). There were 10.16m late votes recorded after Election Day. Obama won these late votes by 59.2-37.5%, a 7% increase in his Election Day share and 15% increase in margin. The final recorded vote total was 131.4 million. Obama won by 69.5-59.9m (52.87-45.62%). 2) Since the winner was known on Election Day, there was nothing to gain by manipulating late votes recorded after Election Day. The unadjusted exit poll discrepancies from the recorded vote were far beyond the 1.2% exit poll margin of error. But the state exit polls were generally very close to the late recorded vote shares. The largest percentage deviations were in states with a relatively small number of late votes – as to be expected. Assuming that the late votes were fairly representative of the total state electorate, then the late votes can be viewed as super exit polls with thousands more respondents than corresponding state exit polls in which 1000-2500 voters are interviewed. Obama won the state unadjusted exit poll aggregate by 58.0-40.5% – a close match to his 59.2% late recorded share. There were 83,000 exit poll respondents. The National Exit Poll (17,836 respondents) is a subset of the state exit polls. Obama won the unadjusted NEP by a 61-37% margin and had a 58.0% share in the True Vote Model. 64.5% of New Jersey’s 224,000 late recorded votes and 63.8% in the unadjusted exit poll. 67.9% of Maryland’s 277,000 late votes and 67.2% in the exit poll. 70.7% of New York’s 584,000 late votes and 71.5% in the exit poll. 54.6% of Ohio’s 500,000 late votes and 56.3% in the exit poll. 51.6% of Florida’s 405,000 late votes and 52.1% in the exit poll. 68.9% of Illinois’ 183,000 late votes and 66.3% in the exit poll. 47.5% of Mississippi’s 77,000 late votes and 48.4% in the exit poll. 49.7% of Tennessee’s 19,000 late votes and 47.7% in the exit poll. 49.1% of South Carolina’s 117,000 late votes and 47.6% in the exit poll. 46.2% of Kansas’ 32,000 late votes and 46.1% in the exit poll. There was a 12% difference in margin between the initial 116.2 million 2-party recorded vote (Bush 51.5-Kerry 48.5%) and the final 4.8m (Kerry 54.3-Bush 45.7%). This resulted in a 0.5m decline in the official Bush margin (3.5 to 3.0m). This red flag indicates that since the election was decided at the 116m mark, election fraud was no longer necessary. Late votes (absentees, etc.) became irrelevant when Bush was declared the winner. The media reported that Bush won by 3.5m votes; they still quote that initial margin today. Edison-Mitofsky matched the Final Exit Poll to the initial 117m recorded votes. Kerry won the unadjusted state exit poll aggregate by 51.1-47.6% (76,000 respondents). He won the National Exit Poll (13660 respondents) by 51.7-47.9%. Assuming that Kerry’s 53.0% share of the 5.0m late votes is representative of the 122.3m recorded total, his vote total is 64.8m. Adding his 75% share of the 3.4m documented uncounted votes brings his final total to 67.4m (53.5%). This is quite close to the True Vote Model which determined that he won by 53.6-45.1%. The model accounted for total votes cast in 2000 (recorded plus uncounted) , assuming 5% voter mortality and a 98% turnout of 2000 voters in 2004. The 12:22am Composite NEP vote shares were used in the calculation. There was a 0.72 correlation between the late state vote shares and the exit polls. For states which had more than 40k late votes, the correlation statistic was a much stronger 0.93, as one would expect. How does one explain the discrepancies between the initial and late recorded state vote shares? Kerry’s late vote share exceeded his initial share in 38 states (15 of 19 battleground states). Corresponding vote discrepancies were significant in the East but near zero in the Far West, strongly suggesting election fraud in early-reporting, vote-rich battleground states. A false impression was created that Bush was winning the popular vote while the state and national exit polls indicated that Kerry was winning big. In the Far Western states there was virtually no difference between the 15.6m initial and 3.3m late recorded vote shares; Kerry was a steady 53% winner. But the Far West average exit poll WPE was 6.4%, indicating a 56% Kerry share. Was vote-padding still in effect? 1) Final state exit polls and a mathematically impossible National Exit poll were adjusted to match the recorded vote. 2) Unadjusted “pristine” state exit polls were close to the True Vote. 3) Final 5 million recorded votes were close to the True Vote.